​"When I started at just yoga I was wracked with arthritic pain everywhere. This made for painful walking, bending and even sitting. I want to tell you that your yoga classes have changed all that and I am now 90% pain free. Your studio and the way you have developed your practice is so very special and was a tremendous part of my moving through loss and healing. 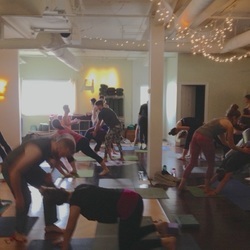 I was a regular visitor to your space and to Christof's classes while I was grieving the loss of very close people to me, and my brother had cancer; it was a very hard time for me personally and I had not previously practiced yoga, but your studio was such a healing, restorative, welcoming, and especially accessible space. Yoga is often very expensive in Vancouver, and sometimes it accompanies a particular lifestyle politic that can feel alienating. For this I was tremendously appreciative of the gentle, anti-oppressive approach to yoga you established in your studio.